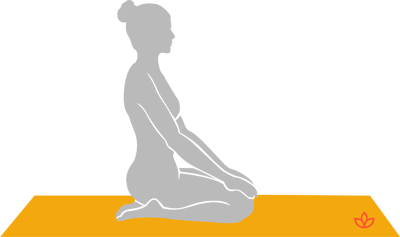 Hero pose, or virasana, is a seated meditation posture. It is similar to thunderbolt pose, but the lower legs are folded back outside of the thighs instead. As such, this pose also requires flexibility in the knees. Start by kneeling. Separate your ankles about as wide as your hips. Exhale and lower your bottom toward the floor and sit in between your ankles. Sit tall. Rest your hands on your thighs. Separate the knees in order to relieve any tension or pain.